Once upon a time, there was a naked little boy who needed some advice about candy. He asked various talking animals for their opinion and finally a geriatric turtle told him to consult with an owl. He naively trusted the owl and was left heart broken when the owl ate his Tootsie Pop and subsequently misinformed him about the number of licks that it took to get to the delicious chocolate center. It is like a psychedelic Aesop fable with the moral being that owls are liars and they will eat your candy. This is a Tuesday Random Music Video Day that was created in the Nacho Donut facility itself. Special thanks to Tootsie Pops, Benny Benassi, Sean Paul and whoever the original animator of this cartoon was. I have been trying to find out who did it and I don’t see it listed anywhere. I only recently discovered this mix of Satisfaction Vs. Temperature and it is one of the best remixes I have ever heard. Again, I don’t know exactly who is responsible for it but I am attributing it to Benny Benassi. It was really a combination of factors which led to this unlikely collaboration. First, I gave out Tootsie Pops for Halloween. At some point after that, I discovered this Benny Benassi Vs Sean Paul remix of Satisfaction. After that, Conan O’Brien and TBS used an owl in in advertisement that Sean posted on Nacho Donut where he pointed out that owls have been known to be liars. Upon reading this, I immediately thought of the Tootsie Pop commercial where Mr. Owl blatantly lies about the number of licks that it takes to get to the center of a Tootsie Pop. I thought that this song would go perfectly with the commercial because Mr. Owl, being the greedy, candy stealing bird that he is, could not wait to get his satisfaction and bit into the Tootsie Pop after only three licks. I think this remix goes together with the commercial just like a hard candy shell goes with Tootsie, or whatever you might want to call the chewy, chocolate center of a Tootsie Pop. Here is the original cartoon in its entirety. It had its debut in 1969 but I became familiar with it in the 1990’s while watching cartoons on Saturday mornings. Usually they just showed a shortened version with the turtle and the owl but I remember seeing the full version from time to time. 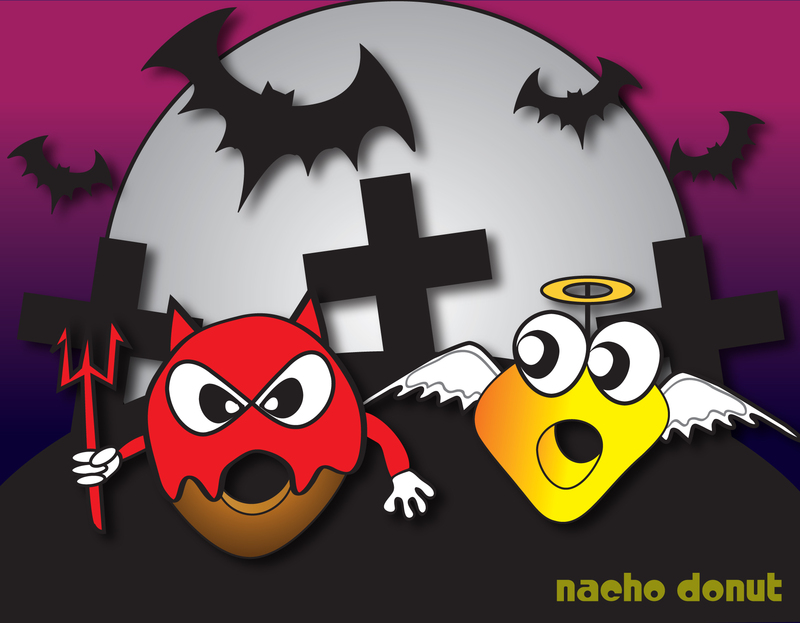 The Nacho Donut Cartoon reps for Halloween. Trick or treat. The evil donut is somehow related to the the team sandwich logo. Candy Corn is an anomaly in the candy world. I rarely ever hear people hate on it but people obviously don’t like it that much otherwise it would be eaten year round like Skittles. I had a bunch of candy corn at my house last week. I kept thinking to myself that it tasted like candles but that did not stop me from polishing off the remainder of what was in the jar. I also ate some candy pumpkins which tasted only slightly different than the candy corn. I guess that I am glad that candy pumpkins don’t taste like actual pumpkins but one would think they could switch it up a bit. At least candy pumpkins resemble real pumpkins. Candy Corn does not really look like corn at all as far as I am concerned. One could say that it is supposed to look like kernels of corn off of some Native American Maize but I am not buying into that school of thought. Also, what is up with the brown ones? They do not even taste like chocolate. If you are going to make something brown that doesn’t taste like chocolate then what message are you really sending? My hypothesis is that the distinct candle flavor that one tastes in Candy Corn is indeed candle. 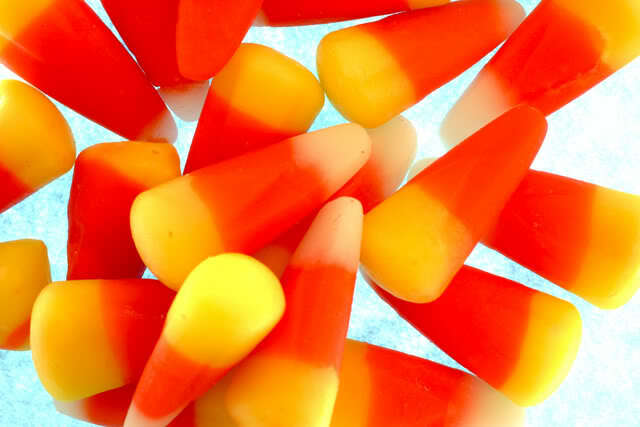 It was originally called “Candle Corn” but it did not begin to sell until they changed the name to Candy Corn. During this time of year people use more candles and eat more candy than at any other time. With this being the case, Candle factories are left with more candle byproducts than usual and the same can be said for candy factories. 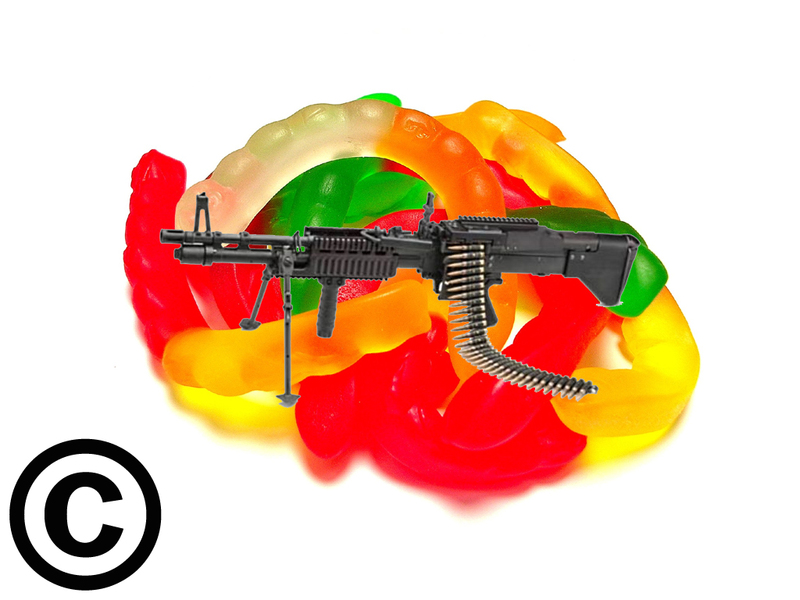 One day the owners of the candy factories got together with the owners of the candles factories and they found a way to combine their worthless byproducts into an indigestible, yet viable commodity. 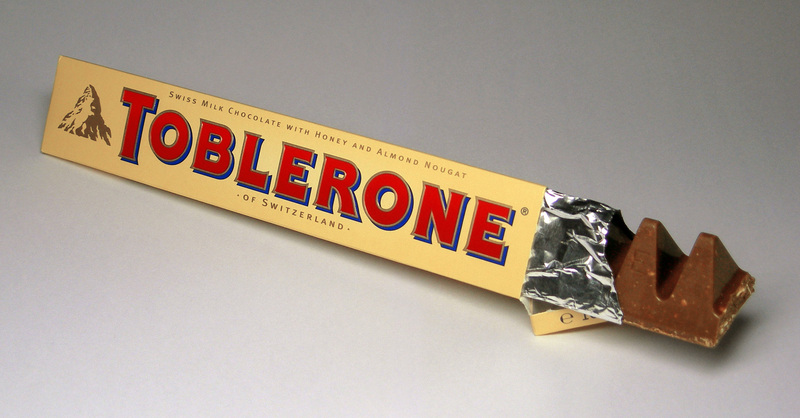 Someday, I will find out if Toblerone is as good as it thinks it is. If you are hip, please let me know what its all about. 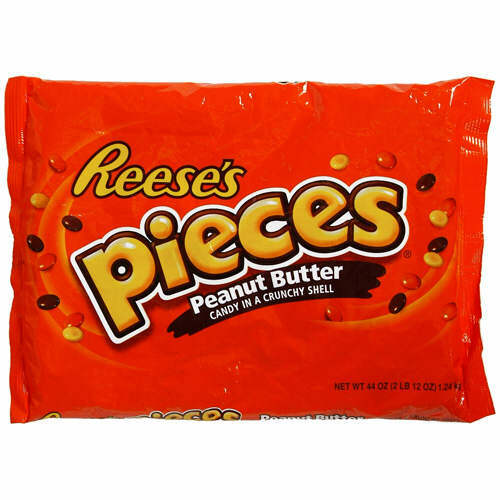 I am worried that it might be the heroin of candy and will ruin me forever after I try it. 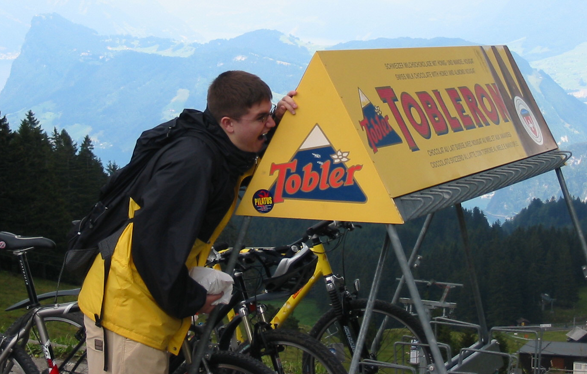 Just look at what happened to these people after they got a taste of Toblerone. This guy was once a successful businessman. He wore a suit and tie to work every day and even had his own secretary. Now look at him. After one bite of Toblerone he went on a mountain-shaped-nougat binge and his life crumbled like Swiss Almonds in a hungry bum’s mouth. Now every morning he pulls on his crotch-stained pink sweatpants, gets down on his knees and does dirty deeds for Toblerone. 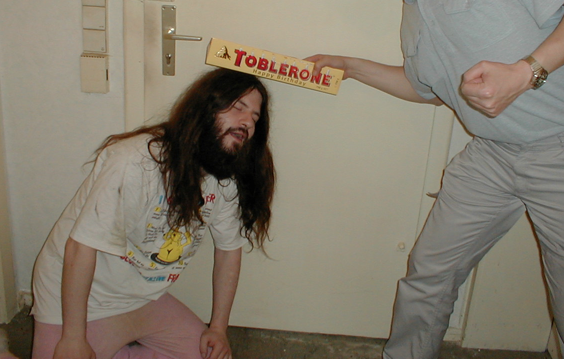 This man’s wife told him that it was either her or Toblerone. Before she could finish the sentence, he was already on his bike heading towards the Swiss Alps. Seeing how he lived in Idaho, this was not the most rational decision but somehow he made it there. Oceans can not even stand in the way of a Toblerone fiend. Why Do I Have a York Peppermint Pattie? 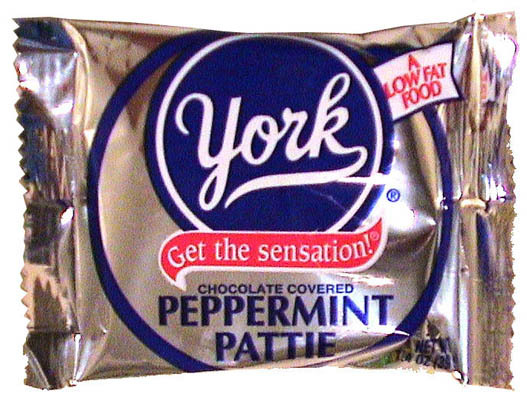 I do not actually have this exact York Peppermint Pattie but the one I have is similar. At some point last year, I acquired a York Peppermint Pattie. I don’t know why but I knew at the time that it made logical sense for me to hide it away in a safe place. A very good reason once existed for me doing this but that reason seems to have been lost to time. I have been looking at it today and I kind of want to eat it but I am not going to until I figure out why I have it. It is possible that I did this just to confuse myself in the future.